While stating the obvious, this research by Stanford geneticists is fascinating. "Mexico harbors one of the largest amounts of pre-Columbian genetic diversity in the Americas," said Stanford’s Dr. Andres Moreno-Estrada. At least a third of my own genetic makeup is Indigenous. The rest is Spanish Sephardic Jew, Irish, and trace mixtures from many other places. My indigenous ancestors, most likely Apache, came from the Sonoran, Southern California, and Western Arizona region. 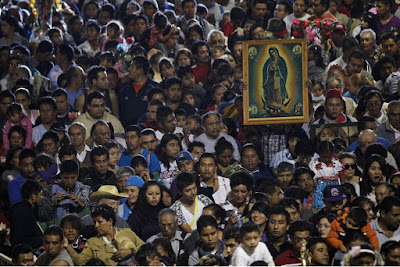 They also came from the Southern Michoacán, northern Guerrero region of Mexico. I have been told that I look Purépecha. Apache, too. I wish I knew. What should not get lost here is that the terms, "mestiza" or "mestizo" track back to racial classification that comes out of colonization by the Spaniards and other groups that colonized the continent (British, French, Dutch, and Portuguese). While hierarchy existed, the research is conclusive that race comes into existence with the conquest and colonization of native people. The term, "white," for example, didn't come into existence until the early 1600s and only so with the consolidation of slavery. And since this is a more recent history relative to the much older, deeper one of blood mixture involving not just empires, but Indigenous people on this continent for millennia, the greatest part of "mestizaje"—the Stanford researchers' findings notwithstanding—involved pre-Columbian, pre-contact, Indigenous peoples. Thanks to Dr. Rudy Acuña for sharing. Medical researchers, doctors and census-takers may lump Latinos or Hispanics into one group, but a giant study of Mexican genetics shows there’s really no such thing. "In this study, we realized that for disease classification it also matters what type of Native American ancestry you have,” said Carlos Bustamante, a professor of genetics at Stanford University. Sign up for top Health news delivered direct to your inbox. "Mexico harbors one of the largest amounts of pre-Columbian genetic diversity in the Americas," said Stanford’s Dr. Andres Moreno-Estrada. "For the first time, we've mapped this diversity to a very fine geographic scale, and shown that it has a notable physiological impact on an important clinical trait: lung function." It will be important as medicine becomes increasingly tailored based on an individual’s genes. Their specific origin — not just a broad racial group — may provide crucial pointers. “When you lose a language, you lose a whole culture." Mexico’s culture ministry recognises 68 indigenous languages – although some experts say there are more than 100 spoken in the North American country. Today, dozens of these languages are at risk of extinction – with battles to stop this being waged on multiple fronts. One of these is literary – with indigenous women among those preserving their languages through poetry and storytelling. Celerina Patricia Sánchez Santiago is part of the Alliance for Indigenous Women in Central America and Mexico (ALIANZA) network strengthening the voices of indigenous women and their participation in feminist movements. 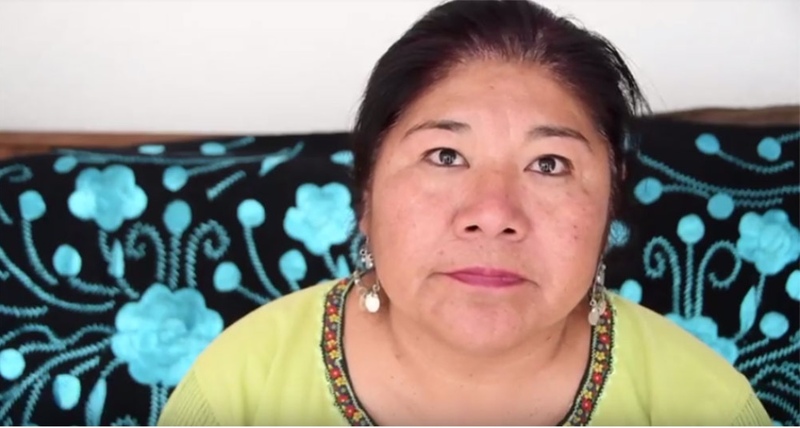 Preserving indigenous languages is “important to understanding who you are, to then understand the world, and to be a part of it,” says Sánchez, a linguist and indigenous rights activist from San Juan Mixtepec, in Oaxaca. Sánchez speaks and writes poetry in Tu’un ñuu savi, the language of the Ñuu savi (‘the people of rain’), about her community’s culture, women’s lives, discrimination, resistance, and the multicultural composition of Mexican society. In 2013, she published “Inií ichí” (‘the essence of the path’), a compilation of her poetry in Tu’un ñuu savi and Spanish. “When you lose a language, you lose a whole culture,” adds Ana Chino Miguel, who is also from Oaxaca. She has written a children’s book as well as other teaching material in Zapoteco, the indigenous language she speaks. Over the years, she told me, elders’ customs have been forgotten. She said that she wanted not only to teach members of younger generations how to read their language but also to introduce them to these traditions. More than 7 million people in Mexico (roughly seven in every 100 of the country’s inhabitants) speak at least one or more of these languages. Mexico is one of the world’s countries with the most indigenous languages, according to government authorities – and second in Latin America after Brazil. Instead, Truthout is fueled by generous donations from readers. Want to support our work? Donate today! "Walk with us," participants tell philanthropic funders at Pacific gathering. Unbelievably sad story from 2017. The Salton Sea is a shallow, saline rift lake on the San Andreas Fault in California's Imperial and Coachella Valleys. In following this story, I was happy to see that Californians voted in a bond measure that will provide $200 million for Salton Sea recovery. Last week, in a discussion among colleagues at UT on students' well-being, I shared that sometimes what affects them is not solely the immediate stresses of their lives, but also the kind of psychic and emotional despair that can come from their awareness of cataclysmic happenings like these that are scarcely even dealt with in our nation's classrooms at any level. I hope most would agree that we in higher education should instead be part of the solution if we are to put learning at the service of social justice—as the late Paolo Freire, the great Brazilian educator himself admonished. WHEN THE DUST RISES IN NORTH SHORE, a small farmworker town at the edge of the Salton Sea, Jacqueline Pozar's nose often starts to bleed. Then her teacher at Saul Martinez Elementary School in nearby Mecca calls her mom, Maria, and asks her to come pick up her daughter. Jacqueline is seven years old. "I feel really bad because I can't do anything for her," Maria Pozar says. "Even the doctor says he can't do anything, that she's suffering from the dust in the air. Most of the children in North Shore have this problem. He just says not to let them play outside." 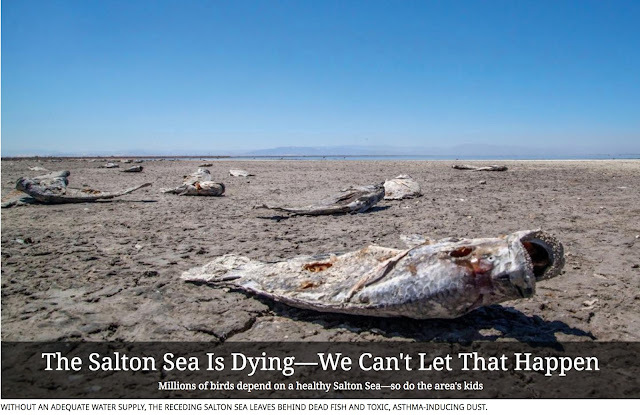 California readers can sign a petition to save the Salton Sea. In June 2018, they can vote for a $200 million bond measure to fund the sea’s environmental restoration. The bloody noses and asthma attacks suffered by Jacqueline and other North Shore children are most likely consequences of the rapidly receding waters of the Salton Sea. As the mud shoreline, or playa, emerges and dries, the wind sweeps up fine particles that coat everything—cars, houses, shrubs, and children's nostrils. When particles less than 10 microns in size lodge in the lungs, they can cause asthma and other illnesses. "The issue of the Salton Sea trumps everything," says Luis Olmedo, director of the Comite Civico del Valle, a community organization in the Imperial Valley, at the sea's south end. "We have to get the air-contaminant level to zero. There is no safe level for the contaminants we have here. We need to stabilize the shoreline." MILLIONS OF YEARS AGO, the Colorado River created the Salton seabed. As the river dug out the Grand Canyon, sediment filled in what are now the Coachella and Imperial Valleys. Between those valleys lay an ancient geologic depression reaching a depth of 278 feet below sea level. Over the millennia, it filled with water and then dried out repeatedly. By the time of the Spanish colonization, it was a dry desert salt pan. ONE WATER SOURCE THE SALTON SEA CAN COUNT ON IS AGRICULTURAL RUNOFF. Then, in 1905, as Imperial Valley growers were building canals to irrigate their farms with Colorado River water, the river flooded and levees failed. For two years, the Colorado poured into the old depression, creating the Salton Sea, whose surface rose over 80 feet above the old seabed. Spreading across 338 square miles, it became the largest lake in California. "My son comes out to play baseball with a glove in one hand and his inhaler in the other." Evaporation would have eventually dried out the sea, but in 1928, Congress designated land below -220 feet as a repository for agricultural runoff. Water from the Colorado, coming through the All-American Canal in the south and the Coachella Canal in the north, irrigated fields and then drained into the sea, maintaining its level at -227 feet but filling it with salt and agricultural contaminants. Today, the sediment lining the shore contains the residues of decades of pesticide and fertilizer runoff. At the same time, the Salton Sea came to fill a valuable ecological niche, becoming a stopover for more than 380 bird species migrating on the Pacific Flyway, including egrets, herons, gulls, eared grebes, white pelicans, Yuma clapper rails, and gull-billed terns. The sea also became a tourist mecca, and starting in the late 1920s, it was stocked with corvina, sargo, and bairdiella; in the 1960s and '70s, tilapia invaded. JAIME JIMENEZ APPLIES HERBICIDE TO BELL PEPPERS AT THE EDGE OF THE SEA. Over the years, the Salton Sea's health deteriorated. Because the sea has no outlet, its salinity has risen from 3,500 parts per million to 52,000 ppm, making it half-again saltier than the ocean. Hardy tilapia flourished, becoming the dominant fish species. Phosphates and nitrates from fertilizers now create algae blooms that deplete oxygen and kill fish and birds. In 2012, the terrible stench from the fish killed by one such bloom smothered Los Angeles for days, demonstrating the distance that toxic dust might travel. Also within range is Mexicali, Baja California's capital city, with more than 650,000 people. In 2003, the other states sharing water from the Colorado River forced California to agree to reduce the amount of water it was taking. 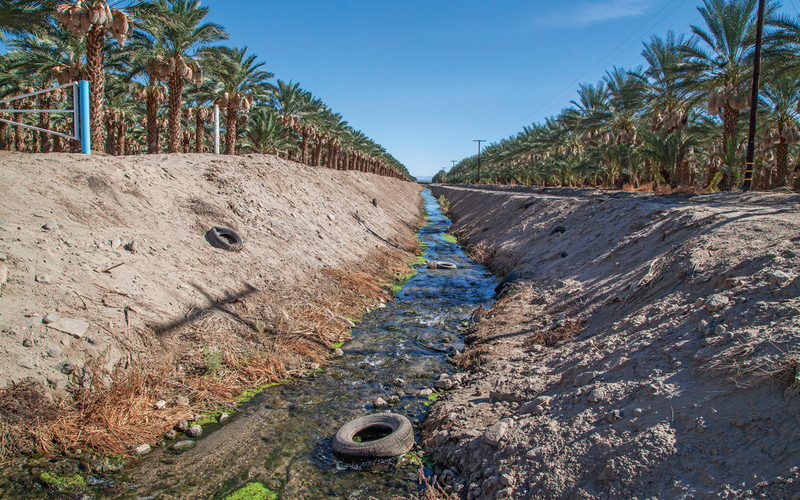 Water that had been used to irrigate the Imperial Valley would flow instead to San Diego. At first, valley growers—pressured by the Sierra Club and others—agreed to fallow some fields, and the saved water continued to flow into the Salton Sea. But fallowing ended in 2017, with water transfers to San Diego scheduled to rise sharply starting in December 2017. The 2003 agreement also said that California would pay to address the Salton Sea's many problems, but for 13 years no money was appropriated. According to a 2005 study conducted by the California Department of Public Health, one out of five children in Imperial County is diagnosed with asthma, compared with one out of seven nationally. Imperial consistently has the highest asthma hospitalization rate among California counties. 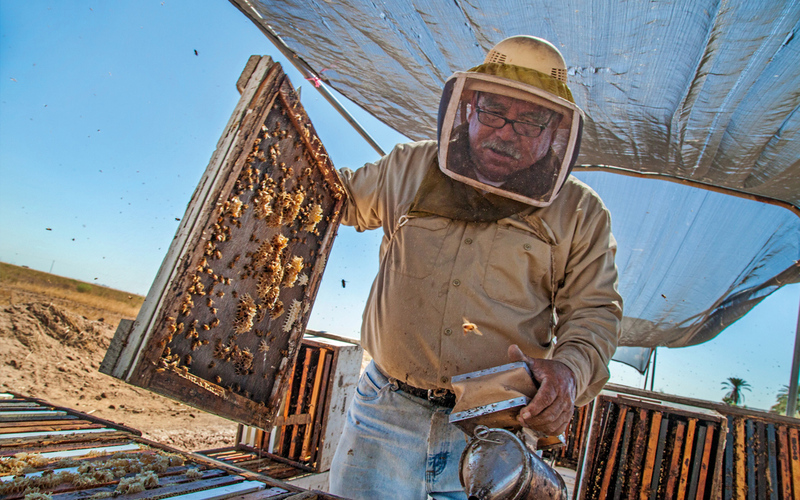 RUBEN SANCHEZ SAYS HIS BEES ARE STRESSED BY THE BLOWING DUST. 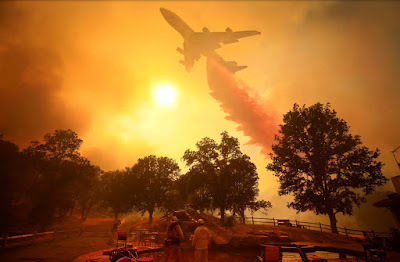 Some small-particle pollution in the area comes from smoke, when farmers burn their fields after crops are picked—a practice the Comite Civico has sought to get banned for many years. 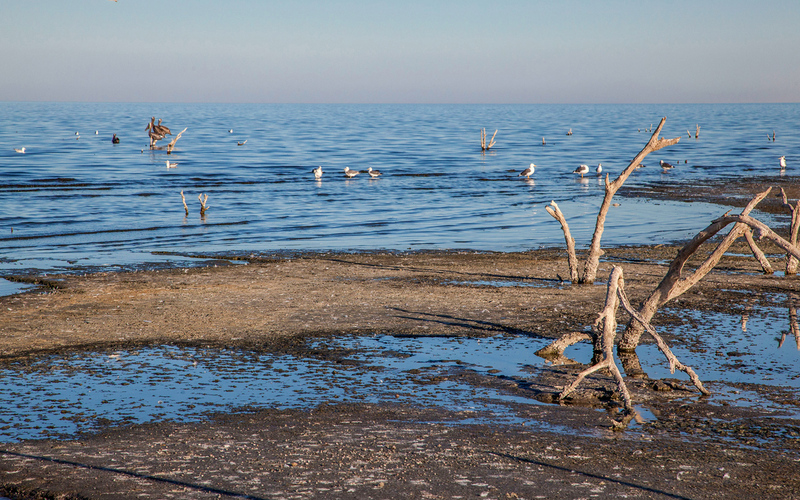 "There's no way to know exactly how much pollution is due to the Salton Sea," says Humberto Lugo, a committee staff member. "But we can say that people's problems are aggravated when the dust blows from the shoreline. I can see this problem in my own family: My son in Calipatria [an Imperial Valley town very close to the shore] comes out to play baseball with a glove on one hand and his inhaler in the other." Calipatria, North Shore, and the other towns around the sea are among the poorest in California. Imperial County's unemployment rate is four times greater than California's average. 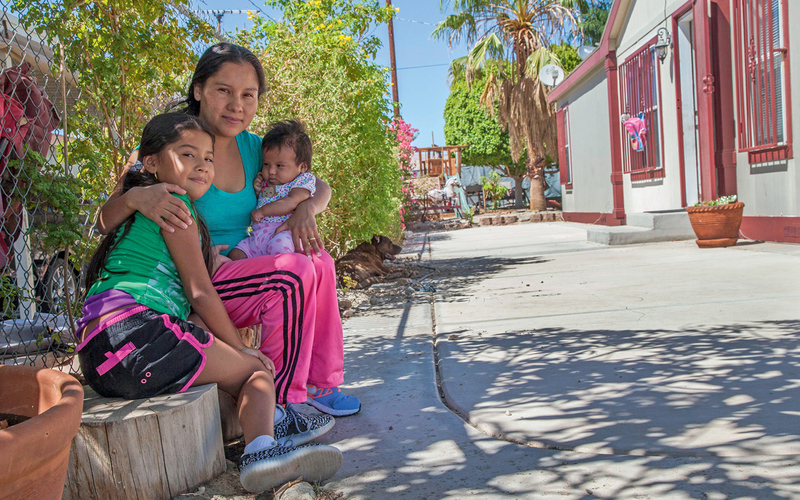 Nearly a quarter of its 177,000 residents—over 80 percent of whom are Latino—live in poverty. 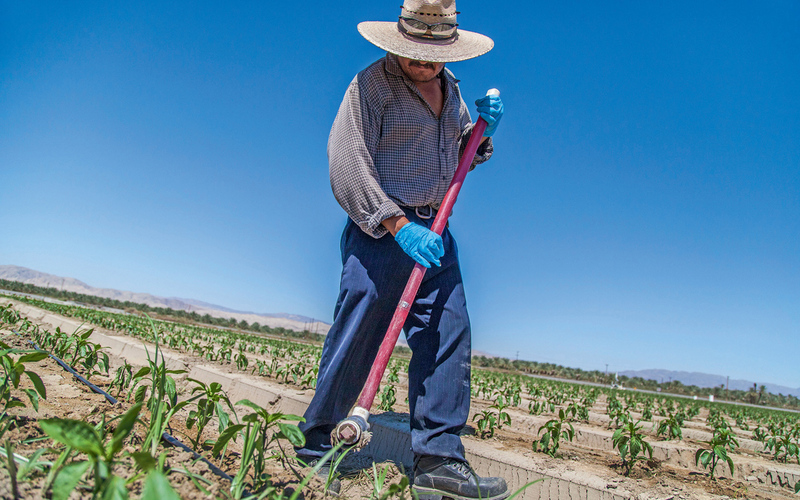 "The wealth of the agricultural industry has been built on the suffering of generations of farmworkers, from direct abuses in the fields to degradation of the land and environment," says Arturo Rodriguez, president of the United Farm Workers. "Nowhere are the hardships farmworkers and their families endure more conspicuous today than with dust pollution from the Salton Sea. What good does it do farmworkers to win better pay and benefits when their health is crippled because of where they live and work?" Organizations like the Sierra Club, the Comite Civico, and the Leadership Counsel for Justice and Accountability have pushed to put health concerns on the agenda in hearings about mitigating the impact of the water transfers. The Comite Civico has put air monitors in over 40 sites, training community residents to understand their use. Many schools now fly flags warning students to stay indoors when the monitors indicate dust storms or severe air contamination. THE SALTON SEA IS AN IMPORTANT STOPOVER FOR BIRDS MIGRATING ON THE PACIFIC FLYWAY. "We should slow down the water transfer and make sure there's no water transfer without full mitigation," the Comite Civico's Olmedo urges. "Full mitigation means that there will be no new environmental exposure that threatens health. We have to keep the hazardous soil in the ground. San Diego should use all of its available resources before pulling water from here. We should be an emergency resource, not a day-to-day water source." In November, California water regulators committed to a 10-year, $383 million plan to stabilize the sea by constructing thousands of acres of ponds, wetlands, and dust-control projects around it. Only $80 million of that amount has been budgeted, but a $200 million bond measure is on the June 2018 ballot (see "Take Action"). Meanwhile, Maria Pozar and her family and neighbors in North Shore have no plans to leave. "We're all poor people, living here because we work in the fields," she says. "My husband has a stable job, and my whole family is here. We can't move. Our kids are growing, and Jacqueline has all her friends here. I have a new baby. Now I wonder if he will have asthma, too." This article appeared in the January/February 2018 edition with the headline "Fighting for Breath by a Dying Sea." MORE Read an interview with Marina Barragán and two young activists with the Sierra Club’s My Generation campaign, which is fighting for both public health and bird habitat in the Salton Sea region: sc.org/barragan. Ominous. These happenings. Even the Arctic is experiencing wildfires. Yesterday, I had to replace four car tires that were just barely three years old due to significant cracking from heat damage! At work, I park in a covered parking garage and in shade at home, too. Still, the heat destroyed them. Friends, especially those of you living in hot climates like Texas, do check your car tires regularly. At least the ones I had on my car fared poorly and were actually quite dangerous. I fear that the heat can make our roads more dangerous, in general. All of this, in turn, is also about global warning—which is what this piece is also about. Mother Earth is responding to our fundamentally flawed relationship to her. Inescapably worrisome when your very species-being is at stake.